SANTA CLARA, Calif. (KGO) -- The San Francisco 49ers are kicking off their season against the Los Angeles Rams tonight at Levi's Stadium. It's a game you'll see on ABC7! The NFL season officially kicked off this past weekend and Colin Kaepernick's colleagues around the league got their chance to weigh in on his protest. So tonight, the question isn't really whether Kaepernick will kneel during the national anthem, but rather how many players will join him. 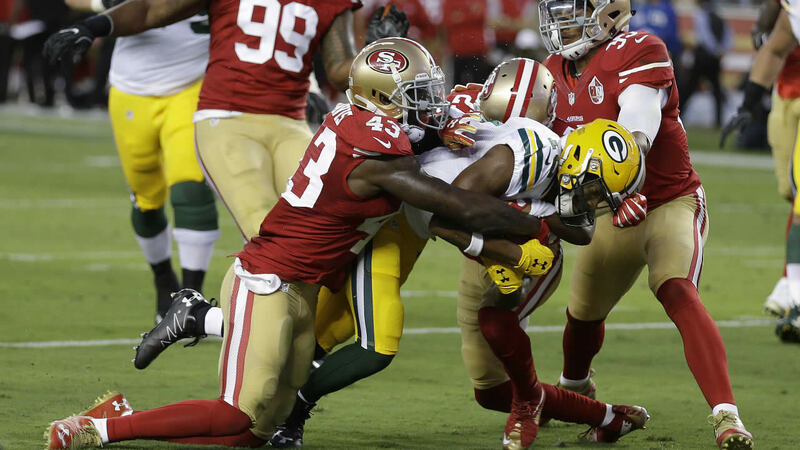 Of course for 49ers fans disappointed with last year's campaign, what happens on the field is the focus of tonight. This is the first test for new coach Chip Kelly and Missouri native Blaine Gabbert will get the start as quarterback. Coach Kelly says Gabbert earned the season opening start through his work ethic consistency and athleticism. "That's kind of in Blaine's DNA in terms of how he operates, it's evidence of the players here too," said Kelly. Gabbert defeated the Rams in Game 17 of the season last year. 49ers fans hope tonight will be a repeat of that performance. It will be a special lineup on ABC7 tonight! Since the 49ers' season opener against the Rams starts at 7 p.m. on ABC7, the season premiere of "Dancing With the Stars" will start at 5 p.m. "Dancing With the Stars" will also be available to watch on the new ABC app starting at 8 p.m. Click here to download the new app.